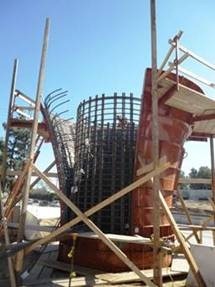 Significant progress has been made on the 210 bridge and now they’re working on the abutments. Below are southern abutment 18 and in the background you can see the walls under construction for the northern one. They should be pouring concrete and completing the 1st column! What you see in the picture on the right is a form that they’ll fill and re-use. 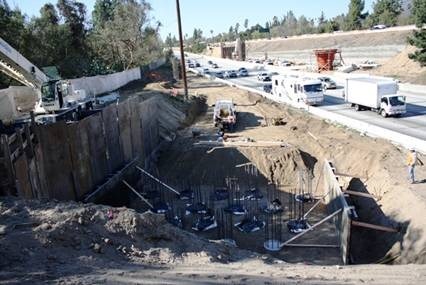 Later this month, the Construction Authority Board will consider an updated Financial Plan to reflect the current construction contract amounts for both the 210 Bridge and the Pasadena to Azusa Alignment. Although there is no change to the project budget overall – both contractors’ bids were within Authority estimates – the Financial Plan will be amended to allocate contingency amounts appropriately to each construction element. Finally, progress continues to be made on acquisition of the maintenance and operations facility property. To date, terms have been agreed to with all but the one private property owner that has filed seven separate lawsuits related to the project. We continue with eminent domain for this property. Separately, the Construction Authority Board will consider a Hearing of Necessity for the city of Monrovia and the Monrovia Redevelopment Agency (MRA) land later this month. Although we are hopeful that the California Supreme Court’s upcoming decision regarding the continued existence of redevelopment agencies will allow us to move forward with the previously agreed-to terms; the scheduled hearing is a necessary step to provide possible options to maintain our overall project schedule should the court’s decision be unfavorable. If you haven’t already seen it, Engineering New Record (ENR) published a story earlier this week about the final design for the I-210 Bridge and its “smart column” technology. Thank you to Habib Balian with Foothill Extension for this information and pictures.